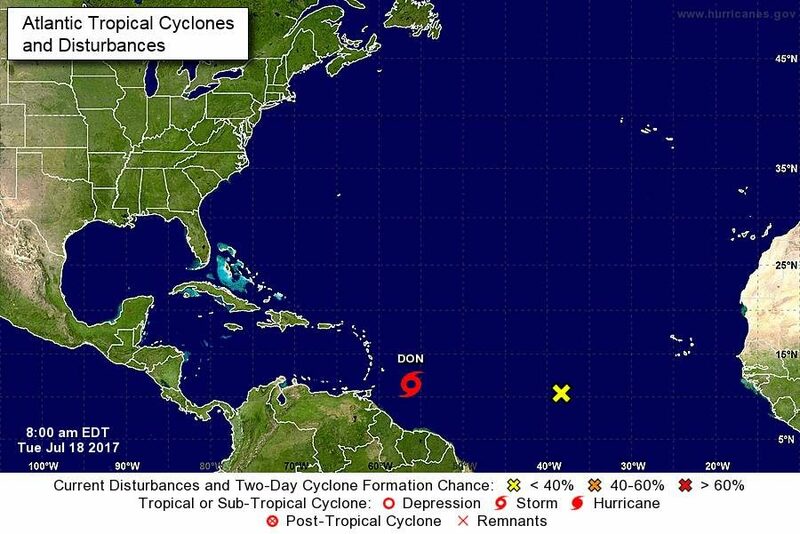 At 8 am, the centre of Tropical Storm Don was located Near latitude 11.4 ° North, Longitude 57.0 ° West about 210 miles South East of Barbados and 320 miles East of Grenada. TS Don is presently moving toward the West near 18mph and a gradual increase in forward speed is expected. Maximum sustained winds are near 50 mph with higher gusts. On the forecast track, the centre of TS Don will move across the Windward Islands late Tuesday and then westward across the southeastern Caribbean Sea on Wednesday. Little change in strength is expected before the system reaches Grenada. Weakening is expected on Wednesday while Don moves across the southeastern Caribbean Sea. 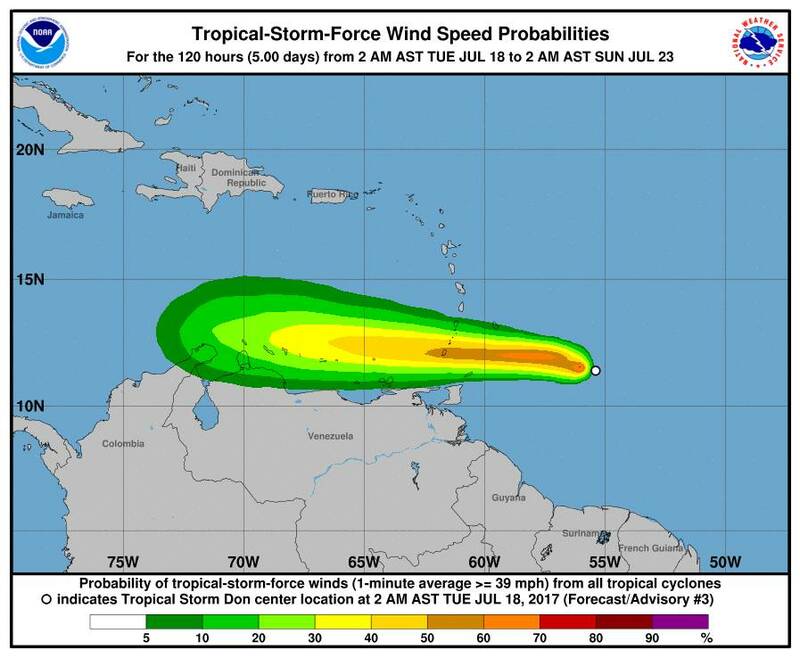 Tropical-storm-force winds extend outward up to 35 miles (55 km)from the centre. As such there is a Tropical Storm Warning for Grenada and its dependencies. A tropical storm Warning means that storm-like conditions can affect the geographic space within 24 hours. Tropical Storm conditions are possible in the area Tuesday and Tuesday night. TS Don is expected to produce total rain accumulations of 3 to 6 inches across the Windward Islands through Wednesday morning. NaDMA takes this opportunity to remind us all that we should continue to be prepared at all times for all emergencies. Also, it is a good time to ensure that all drains and water ways around your property are cleared from all obstructions and that you have in place your hurricane plan and preparedness kit.